South Africa’s great short story writer, Herman Charles Bosman, is perhaps best known for his rather droll, much-loved Oom Schalk Lourens stories. Oom Schalk is a raconteur who tells stories featuring the hardy and somewhat eccentric Afrikaner folk who inhabited the dry bushveld area of Groot Marico in the first half of the 20th century. These stories of enormous character and atmosphere have served as an inspiration to many theatre makers. There have been several story tellers who have used this material and there has been a variety of dramatisations. Now we a have an unusual physical theatre adaptation of these masterpieces. 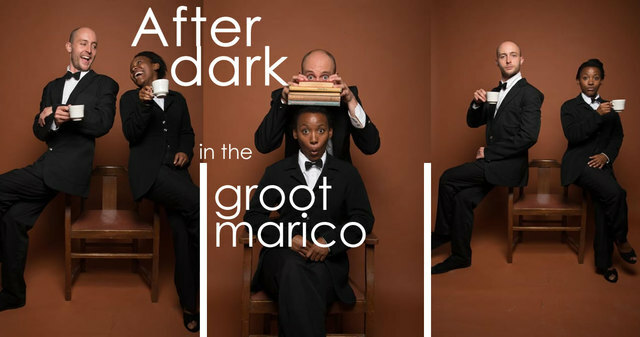 Created by Andrew Laubscher and Tara Notcutt After Dark in The Groot Marico is a follow-up to their award-winning Mafeking Road and was seen at the Hilton Arts Festival this year. The stories presented in this production are Music Maker, Pink Roses and Brown Water, Unto Dust and Veld Maiden. 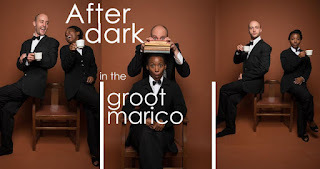 Andrew Laubscher is joined by Fleur du Cap winner for Most Promising Student, Sive Gubangxa, on stage for an intriguing display of physical theatre and storytelling. On a bare stage and dressed initially in black suites complete with black bowties, they use only their bodies and voices to act out the tales. It is a kaleidoscope of movement and vocal sound effects as they take it in turns to tell the stories and attempt to depict the atmosphere and environment so expertly fashioned by Bosman. Physical theatre requires considerable work on the part of the audience member to translate and understand the action on stage. I also have no doubt that there is also room for alternative translations. By that token I found it difficult to equate much of what I saw to the stories of Bosman. For example, during the production the two actors dramatically divest themselves of their bowties, jackets and shirts, leaving them in t-shirts and black trousers, I have no idea why. There is no doubt that these two actors are very good at the discipline of physical theatre. Particularly Gubangxa, a diminutive young lady, was very impressive. They made the most of the drama and humour inherent in the Oom Schalk stories.